It's true that risotto generally requires a bit of attention, but we think it's totally worth it! 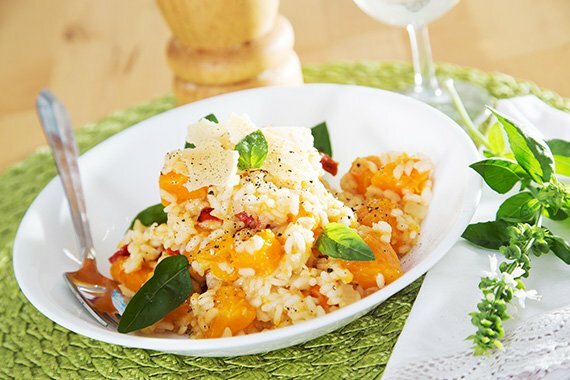 In this dish, the pumpkin slowly cooks with the arborio rice and stock, retaining it's shape. The sun dried tomatoes pack a little punch of extra flavour - finished off with butter and parmesan, it's a little mid-week decadence. Enjoy with a crisp white wine and don't forget to share the moment you plate it on Instagram #youplateit. Peel and small dice ¾ of the onion (you will have remainder). Peel and de-seed pumpkin, cutting into 1-1.5 cm pieces. Drain sundried tomatoes and thinly slice into strips. Pick basil leaves, discarding stems. Heat oil in a deep sided pan or pot over medium-high heat. Add onions and pumpkin and cook for 8 minutes, until they begin to soften. Meanwhile heat up vegetable stock (we warmed ours in the microwave for 1 minute). Add the rice and cook, stirring, for 2 minutes or until the grains of the rice appear glassy. Add the wine and cook, stirring constantly, for 1-2 minutes or until the wine has been absorbed. To finish, gently fold through butter and parmesan (reserving a little for garnish). Season well with salt and pepper. Divide risotto between bowls and garnish with reserved parmesan and basil leaves. Serve straight away. Enjoy!